This book presents a comprehensive review of health care quality in the Czech Republic. It finds that over the past 20 years, the Czech Republic witnessed the unprecedented gains in quality of health care and life expectancy and successfully transferred its Semaschko system into the modern accessible health care system with private-public mix of providers. Nevertheless the health care system in the Czech Republic still has some way to go to achieve the outcomes of the best performing OECD members. 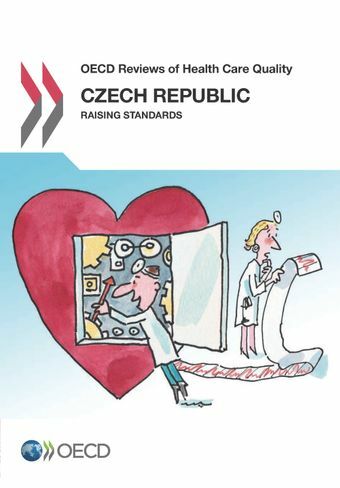 While some of the gap might be caused by the one of the lowest levels of health care expenditures among OECD countries (7.2% GDP in 2011) there are possibilities to improve the outcomes without incurring much of the additional costs.The Czech authorities should reach a consensus on the development of quality of care and data infrastructure and aim for sustainable long-term initiatives undisturbed by the political cycles in both of these areas. While the adverse events reporting and voluntary accreditation are the good steps towards the accountability of the providers, the government should do more in this area, undertake the effort to broaden the accreditation process and include outpatient care and link public health authorities to the quality agenda of inpatient care. In the area of data infrastructure more data should be gathered, the process of data gathering should be streamlined and administrative burden for the providers lowered primarily via the merging the data-collecting agencies. Finally, without the active participation of health insurance funds and proper reimbursement mechanisms in place the quality agenda will not be perceived as the priority. The Czech Republic’s data infrastructure is weak and fragmented, and there is little information for patients on hospital performance. More solid infrastructure and data collection would make it easier to monitor quality, and make patients better informed. The Czech Republic takes a voluntary approach to quality assurance, which enables hospitals to escape scrutiny. A shift to mandatory accreditation would give hospitals stronger incentives to improve performance. The Czech Republic’s primary care system is failing to prevent chronic disease. Focusing more on evidence-based prevention and screening programmes would help reduce the incidence of these conditions. GPs aren’t playing an active role in managing complex patients with diabetes. Giving GPs incentives and training to adopt a leading role in diabetes treatment would improve quality and co-ordination of care.